The smallest Grebe in the region. 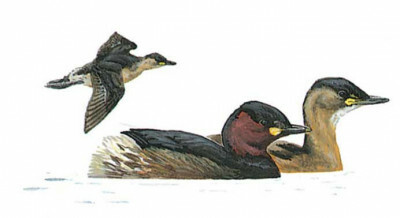 Identified by small size, blunt-ended body, short neck and bill, and absence of white in upperwing. Adult birds have dark brown throat and cheeks with a yellow gape patch. In the winter, adult and juveniles paler brown above, pale buff below, variably mixed with dull chestnut on fore-neck (adult). Light gape is often reduced or absent. Juvenile has white striped head and hindneck. Dives with fast jump and splash when alarmed. Dives rather than flies.Flight is only for a short distance with very rapid wing-beats low over water.